What is a Centre of Innovation? Six ECE Centres chosen to be Centres of Innovation. Aoga Fa’a Samoa is a Centre of Innovation. Innovative Teaching and Learning at A'oga Fa'a Samoa. Key People involved with COI Project. COI Published Papers, Workshops, Conferences & Presentations. “Centres of Innovation” (COI) is a Ministry of Education initiative falling out of their 10 year strategic plan for Early Childhood Education (ECE) – Pathways to the Future. Early Childhood Education Centres of Innovation (COIs) were announced in Pathways to the Future, Nga Huarahi Arataki (2002). Teachers and educators in six COIs will research what gives their centre a reputation for effectiveness, and will open their doors to show others their innovations and findings. To develop and document innovative learning and teaching practices using Te Whaariki, early childhood curriculum. To work with researchers to find out what children gain from these innovations. To share information with others about their innovative learning and teaching practices. This new early childhood education initiative will be used to build a strong research base to inform and develop models of best teaching practice. Press Release, Ministry of Education, 2003.
" Investing in quality early childhood education is crucial to children's learning and their opportunities in later life,"
" The good teaching and learning practices these centres are currently using will be further developed in collaboration with researchers and that information will then be available to other services." " This investment is part of the Government's commitment to increasing participation, improving quality and promoting collaborative relationships in early childhood education. This is particularly important for Maori and Pacific children who currently participate less than others." Visit this link at the Ministry of Education website for detailed information about COI. Special characteristics were important in the selection of the six Centres of Innovation. 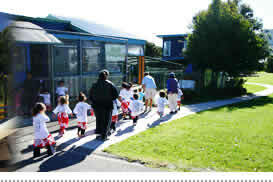 They include competent practice in teaching and learning in: Kaupapa Maori services, Pasifika immersion and bilingual services, Services that integrate IT and ICT into the curriculum, and ‘Community of learning’ approaches evident in the collaborative relationships with parents and whanau, and with other programmes, agencies and/or schools also mattered. Pasifika immersion ECE (provides quality Pasifika early childhood education) and ‘community of learning’ approach. IT/ ICT in ECE (widespread and integrated use of information technology, with good levels of parent involvement) and ‘community of learning’ approach. Te Kohanga Reo o Puau Te Moananui A Kiwa, Auckland. Showcases Maori language based learning, Kaupapa Maori Kohanga Reo, and ‘community of learning’ approach. Wycliffe Nga Tamariki Kindergarten, Napier. Good collaboration with Maori and Samoan communities, and good parent involvement through use of information technology and 'Community of learning’ approach. Displays a strong commitment to education and involvement of parents, and the innovative use of schema learning theory‘ and Community of learning’ approach. Innovative use of Reggio Emilia approach and commitment to development and ‘Community of learning’ approach. A'oga Fa'asamoa is a Samoan immersion education and care centre located in Ponsonby, Auckland. Infants, toddlers and young children attend for up to nine hours daily, up to five days per week, learning in the Samoan language. In May 2003 the A'oga Fa’a Samoa was selected by the Ministry of Education to be one of six Centres of Innovation nationwide to undertake a three-year research and development project. Special characteristics of the A’oga Fa’a Samoa are its’ Samoan immersion programme, and its “community of learners” collaborative approach. A'oga Fa'a Samoa uses a rich array of approaches to promote Samoan language and culture and the children's cultural identity. It has close links with the school communities on site, especially the bilingual Samoan class in the school for transition of children and to help maintain confident and competent bilingual speakers. Small groups of children stay with the same teacher from point of entry through different groups and spaces in the centre and into school. The effects on children's learning, including learning Samoan language and culture, of joint educator-child transitions will be studied. This project is designed to examine the relationship between learning and language continuity, as children and educators at the centre make transitions from the point of entry through to beginning school. A related intention is to document aspects of the identity, strength and the confidence of the children. (Auckland College of Education). Research Associate. Ene Tapusoa, Au Luatua, Ta’a Tuai. (Ta’a Tuai replaces Malo Moananu who recently moved to Australia). Tanya Samu-Wendt: Focus Group Facilitator. The COI research associates for the Aoga Fa’a Samoa are. Dr Airini from Auckland College of Education. Rationale for a Focus (Advisory) Group. The COI project draws on the action research approaches used previously in New Zealand studies (Carr, May, & Podmore, 2000) to implement an action research spiral approach. This includes observing, reflecting, planning, and acting (derived from Kemmis and McTaggart, 1988). Data collection methods include focus group interviews and discussions, observations, teacher diaries, and survey/self-report techniques. The focus group will be an advisory team who will lead the COI project, as well as an focus group. The focus group includes a facilitator, 2 staff members, 2 researchers, 1 representative from centre management, 2 parents, the centre manager, a centre support person. The focus group ensures full involvement of the centre. How do we assist Samoan language communication in the centre? Probe: Links to Te Whariki (Ministry of Education, 1996). - From the infants’ and toddlers’ area to the over-2s area? - From the over 2s area to the primary school? Probe: Focus on “critical incidents” (Airini & Brooker,1999). What are our main expectations/aspirations for children at the centre? What helps learning and language continuity as children make transitions within and from the Aoga faa-Samoa? How can the key approaches that help learning and language continuity be complemented in practice? The research is designed to address the above research questions within the context of the Aoga faa-Samoa and its community as well the benefit to the wider community. The sampling design includes children at two transition points as well staff at the centre. The transition from the aoga Faa-Samoa to the primary school on the adjacent site. Developed a visitor’s policy. With an increased influx of visitors, we must consider very carefully how we can provide for visitors and at the same time ensure that. The children’s programme is not compromised or disrupted. The ongoing research project is not jeopardized. The overall integrity of the centre is maintained. (Progress Report Date: 30 April 2004). Submitted a research proposal to the Ministry of Education (2003). Gained ethics approval through Victoria University Human Ethics Committee (2003). Collected informed consent from parents whose children have been identified as research participants. (2003). Commenced and nearly completed the first spiral of action research (2003 start). Formed a focus group comprising of people identified above and parent representatives. (ongoing). Presented initial research information and activities at conferences. Jan Taouma, Dr Podmore, and Dr Airini have also written papers that have been presented within the context of the COI research. (Ongoing). Reported as required by contract to the Ministry of Education. Milestone reports and other documentation are available for viewing at the Aoga Fa’a Samoa as hard copies – click here for downloads. Included COI information on our regular Aoga Newsletter, and have begun to distribute newsletters devoted specifically to COI information. These initial stages have been very encouraging and exciting and we are looking forward to completing and reporting on the first spiral of our COI research. Prepared for the Ministry of Education under contract between the Ministry and Victoria Link Ltd.
© Crown copyright. The views expressed in this report do not represent the views of the Crown. What helps effective transition in Early Childhood Education: Perceptions of good practice in Samoan ECE. A research paper prepared for the A’oga Fa’a Samoa, Auckland, and the University of Victoria at Wellington, New Zealand. This paper is about adult perceptions of what helps children through transition phases within a Samoa immersion ECE setting, and from that setting into primary school. In short, this is about times of change in ECE and what helps make them happen in ways beneficial to a child’s holistic development. Innovation and Collaborative Research Development in an Early Childhood Centre. (Podmore, et al. 2003). Paper 1 in the Symposium: Research Development and Implementation in New Zealand's Pacific “Early Childhood Centre of Innovation” presented at the joint NZARE-AARE Conference, Auckland, 29 November–3 December 2003. A Samoan-Language Immersion Centre's Journey Into Action Research. Paper 2 in the Symposium: Research Development and Implementation in New Zealand's Pacific “Early Childhood Centre of Innovation”, presented at the joint NZARE-AARE Conference, Auckland, 29 November–3 December 2003.